Mother Nature continued to side with the Russians. 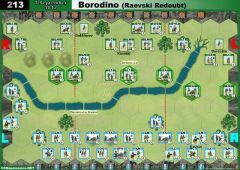 As the French army retreated west, it was faced with the daunting task of crossing the unfrozen and unbridged River Berezina. On the west bank blocking the crossing was a force of 30,000 Russians under Admiral Chichagov. Wittgenstein with another 30,000 soldiers approached from the north on the east side of the river. Napoleon ordered Oudinot on the 26th to draw off the enemy to give his engineers time to bridge the river. The Russians took the bait and moved their main force south. Now the French engineers went to work, and two bridges were constructed in a matter of hours. General Eble, chief of engineers, was able to perform this miracle because he had disobeyd Napoleon’s direct order to destroy all engineering equipment. The Grande Armee began crossing, largely undisturbed. By the morning of the 28th,Wittgenstein’s Russians were advancing in earnest against Victor’s rearguard Corps on the east side of the river. When one of his divisions under General Partouneaux took the wrong road, the Russians surrounded and destroyed it. With the loss of the division, Victor was having serious trouble holding off the Russian onslaught. 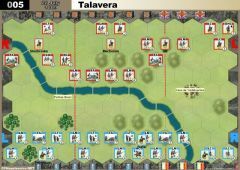 Napoleon ordered the Baden brigade to cross back to assist Victor, but the Russian kept advancing. The Russian’s finally retired for the day, when attacked by a gallant cavalry charge supported by the French artillery on the west bank. On the west bank, Admiral Chichagov was doing his best to break through the French perimeter to seize the crossing sites. Marshal Oudinot was severely wounded and his corps was pushed back. Marshal Ney quickly assumed command and ordered the French Cuirassiers to charge. The Russian fell back and did not attempt any further attacks on the west side of the river. 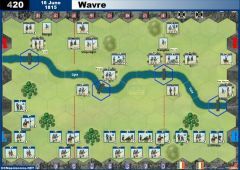 Throughout the night the rest of the French army crossed the river. 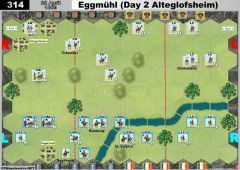 General Eble had urged the throngs of stragglers and camp followers to cross in the gaps between the French formations, but many did not do so. Reluctantly he issued the necessary orders to fire the bridges to prevent Russian pursuit. Thousands died as they stampeded vainly to cross, and thousands more perished as the Cossacks fell upon them. 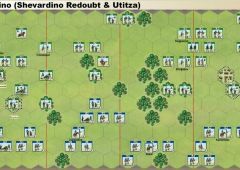 • Each turn, one ordered French unit or Leader may exit the battlefield from any French right bottom hex ("exit"). 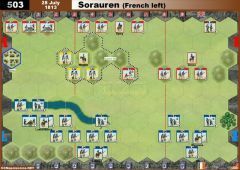 Any French infantry unit leaving the field this way will count as a Victory Point for the French army. 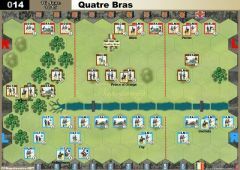 The other French units and Leaders can exit the same way with no Victory Point. 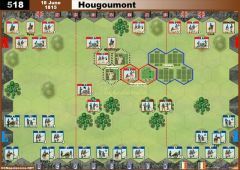 • Any French infantry unit or Leader eliminated counts as 2 Victory Points for the Russian Army. • A French Leader cannot escape from the bottom French left side of the river. • Killing Napoleon is an immediate victory for the Russian. • The River Berezina is impassable except at the bridge. • Pre-Battle Mother Russia Roll is in effect twice (right and left bank). Saber rolls have no effect. 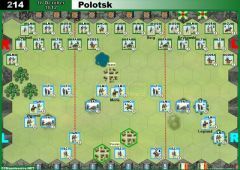 Please try it out with this little change in the special rules: "Any French INFANTRY unit or Leader eliminated counts as 2 Victory Points for the Russian Army"
I'll check that with Alessandro. To be said: We use to play this scenario 2 vs 2 with a map of 6 SECTIONS (3 per player!) having the right french player concentrate on leaving the field while the left player is concentrate on evacuating the left bank and it is balanced this way. 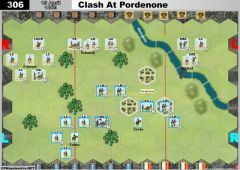 The point is playing it with this official 3 sections map may create problems for the French to achieve both strategy with efficiency? Just try it out and let me know! Hope some day we will meet to play it ! 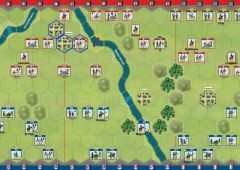 I love this battle - The only point is we play it with 6 sections and 2vs2 so the right french player can use the center & right cdt cards to exit and it's balanced but i donno the balance if you guys play it with the official 3 sections - Can't wait for your reports!